Erja Lyytinen plays Backstage at the Green Hotel Kinross on Sunday afternoon at 2.30pm on 24th March 2019 for EMS /Mundell Music. 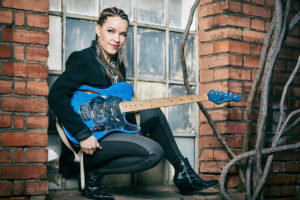 Finnish slide goddess” (The Blues Magazine) Erja Lyytinen is a singer, a slide guitarist and a songwriter who plays over 100 shows every year and releases albums through her label Tuohi Records. After her latest Stolen Hearts album, which was mixed by Rolling Stones producer Chris Kimsey, she performed on the Finnish TV show “Stars Stars” for millions on TV and is building a career that has taken her to perform together with Sonny Landreth among others. In November 2017 Erja won the European Blues Award for “Best Guitarist” and was voted the 7th best blues guitarist in a poll of The MusicRadar. In June 2018 she opened for Santana at their show in Helsinki’s Kaisaniemi Park.